President Obama, in a speech to the nation on the eve of the thirteenth anniversary of 9/11, declared that the United States is engaged in a war to degrade and then to destroy ISIL – the Islamic State of Iraq and the Levant. As an American Christian committed to working for peace, I objected to Obama's declaration for two reasons. First, Obama wrongly characterized ISIL as a terrorist organization. Thankfully, he and other administration officials have since altered their language; they now describe ISIL as an insurgency instead of as a terrorist organization. Unfortunately, the image of ISIL as a terrorist group persists. Accurate terminology is important. Terrorist organizations are non-state actors who commit violent acts against innocent civilians to advance the group's political agenda by manipulating a government. Insurgents seek to overthrow the existing government and to replace it with their own government or state. An insurgency may begin as a terror group, but, unlike a terror group, an insurgency establishes a government and controls territory. Accurately defining the problem is essential because effective counterterrorism requires implementing a different strategy and tactics than does a counterinsurgency. ISIL has committed appalling atrocities on a significant scale. In the West, the highest profile examples of those atrocities are the beheadings of two American journalists and a British aid worker. However, those beheadings are only three of hundreds of beheadings that ISIL personnel have performed in addition to their other reprehensible actions that include the attempted genocide of a religious minority (the Yadizis), misogynist policies toward women, etc. Visceral revulsion to ISIL's horrendous actions is an insufficient justification for waging war. Instead, Just War Theory's jus ad bellum framework provides Christians a paradigm for assessing when war, of which counterinsurgency is one type, is ethically justifiable. There are six jus ad bellum criteria; a just war must satisfy all six. The first jus ad bellum criterion is that a war must have a just cause. Historically, just cause connoted a sovereign state defending its territory in response to an incursion by another state. More recently, many Christian ethicists have advocated expanding just cause to include defending innocents against an egregiously abusive state, e.g., in the case of genocide. ISIL, unlike the terror organization al Qaeda from which it emerged, claims to have established a sovereign state (hence the group's name, the Islamic State of Iraq and the Levant). A caliph, presumably ISIL's leader, will govern the new state; ISIL sees this caliph as the successor to the Muslim caliphs who ruled much of the Middle East and North Africa prior to the European colonial era. ISIL has attempted genocide against people under its rule, establishing prima facie just cause for other nations to intervene. The second jus ad bellum criterion is that those waging a just war should have right intent, i.e., intend to establish a more just, fuller peace. On this point, the case for waging war against ISIL is more problematic. President Obama in his speech to the nation emphasized the need to protect Americans and American interests in the Middle East. A significant part of the American presence in the Middle East is because of the oil there. However, other reasons for the American presence and interest in the Middle East are less self-serving. ISIL's agenda includes reestablishing a caliphate and obeying their interpretation of Sharia (Islamic law) that mandates killing all Jews and Christians in Muslim lands and killing all apostate Muslims, i.e., Shiites and moderate Sunnis. The global community has an ethical and legal responsibility to protect the innocent. The third jus ad bellum criterion is that right authority must declare the war. Right authority connotes a state's political authority, e.g., in the US, the Constitution specifies that Congress alone has the authority to declare war. With the world becoming flat (to use Thomas Friedman's memorable metaphor), Christian ethicists have begun discussing the merit of redefining right authority in international terms. President Obama claimed that Congressional authorization to hunt down those responsible for the 9/11 attacks and to prevent future terror attacks gave him authority to take military action against ISIL. If ISIL is not a terrorist organization, Obama's reliance on the post-9/11 Congressional action becomes more tenuous. Alternatively, some Constitutional scholars believe that a President has the authority and responsibility, without waiting for Congress to declare war, to defend the nation against possible attack. In either case, Obama requested Congress to fund, and thereby to endorse, his proposed military actions against ISIL. The Obama administration is concurrently striving to form a broad international coalition to participate actively in efforts to destroy ISIL. The fourth jus ad bellum criterion is that a just war is proportional, i.e., a just war should cause less harm than would otherwise occur. Predicting the amount of harm that military action against ISIL will cause, particularly the harm to innocents euphemistically known as collateral damage, is difficult. However, given ISIL's brutal (though short) record and lengthy list of enemies, battling ISIL would have to result in highly improbable amounts of collateral damage to become credibly disproportional. The fifth jus ad bellum criterion is that a just war is the last resort. ISIL shows no sign of being open to negotiation. ISIL is committed to the violent overthrow of Iraq and Syria; ISIL is similarly committed to the full implementation of its extremist version of Sharia. Following its military successes and territorial grabs, ISIL now earns about $11 billion annually selling oil on the world market. Selling that oil requires the cooperation of other nations as intermediaries and buyers. One hopes that no developed nation would buy oil directly from ISIL. Likewise, purchasing arms with funds generated by oil sales requires third party assistance to first purchase and then to deliver the arms to ISIL. Stopping ISIL from selling oil and purchasing arms are two steps, short of waging war, which the US and other states, working cooperatively, can take toward significantly degrading ISIL's warfighting capacity and ability to sustain a viable government. These efforts, even if fully successful, will probably fall short of destroying ISIL. The final jus ad bellum criterion is that a just war must have a reasonable chance of success. Waging war to end horrendous evil in the absence of a reasonable chance of success simply increases the total amount of harm, death, and suffering without moving the world closer to peace. The US and its coalition partners do not have a reasonable chance of success against ISIL. This was the second and more basic reason that I objected to Obama's declaring the US would conduct military operations to degrade and then to destroy ISIL. The US invasions and extended occupations of Iraq and Afghanistan underscore the futility of outside forces, even with vast military superiority, attempting to force regime change on an unwilling people. Only the people of Iraq, Syria, and the adjacent Muslim countries can defeat ISIL. These are the people ISIL threatens most directly and who have the most to lose from ISIL's continuing military successes. Contrary to what media reports infer, ISIL has significant support among Sunnis in Syria and Iraq, as its military successes demonstrate. ISIL's repeated defeats of Iraq illustrate why success against ISIL is unlikely. Iraq has a large standing army and a small air force. The US has spent billions of dollars equipping Iraq's military and a decade training them. 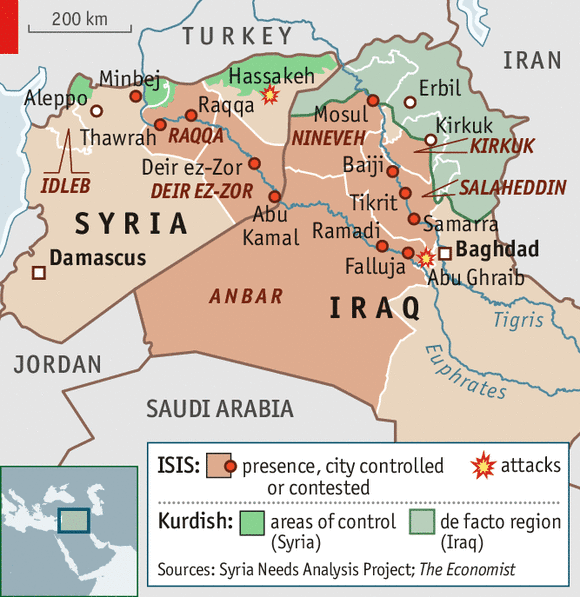 Theoretically, Iraq's military has strong motives for defeating ISIL at any cost. Iraq's fate as a nation hinges upon ISIL's defeat. More importantly, a disproportionately large percentage of Iraqi military personnel are Shiites whom ISIL considers apostate Muslims deserving of death. Yet ISIL, in spite of fighting without an air force, without billions of dollars' worth of modern equipment, and without the benefit of foreign military advisors and training often defeats Iraq in battle. Indeed, ISIL's forces consist primarily of fighters ISIL recruited locally in Iraq and Syria. ISIL's few hundred volunteers from Europe and North America are not decisive for ISIL's military successes. Similarly, ISIL initially scrounged most of its weapons and munitions locally in Iraq and Syria. Arab nations (e.g., Saudi Arabia) agreeing to provide air power in the fight against ISIL represents a positive development. The US has sold billions of dollars' worth of warplanes to Saudi Arabia and trained Saudi pilots and maintenance personnel. If Saudi Arabia is ill prepared to fight ISIL, this exposes the hypocrisy of US arms sales. If Saudi Arabia is reluctant to play a prominent role in the fight against ISIL, this bodes ill for the odds of success and stability in the Middle East. Air power may retard the pace of insurgents' victory, but air power alone has never defeated any insurgency. Ending the evil of ISIL represents an opportunity for Sunnis and Shiites, and Sunni and Shiite dominated governments, to cooperate in opposing a common threat. Also, the US should enlist Iran, the world's most populous and powerful Shiite state, in efforts against ISIL. This might constructively expand US-Iranian engagement, lead to progress in efforts to limit nuclear proliferation, allow Iran to exercise positive hegemony among Shiites, and, in time, diminish Iranian support for Shiite terror groups. Diplomatic overtures along these lines arguably incarnate what Jesus meant by loving one's enemies. The sine qua non for defeating an insurgency is that the governments and peoples the insurgency threatens must have the will to win. Otherwise, the insurgency continues to expand, gaining military strength as it gains control of territory, people, and other resources. Obviously, the will to win has been lacking in Iraq. Arab nations who succumb to US pressure to join the fight against ISIL will generally lack the will to win. No war is just unless those fighting for justice have a reasonable chance of success. As a Christian actively working for peace, I find myself repeatedly humbled in the face of situations, such as the insurgency waged by ISIL in the Middle East, for which I can see no viable, ethical solution that will speedily end or prevent great suffering. So, what is a Christian to do? First, pray fervently and daily for peace. Second, openly endorse and aid faithful Muslims who denounce ISIL as an aberrant and evil expression of our shared Abrahamic tradition. Third, oppose government actions that may appear well intentioned and expedient but are unjust when measured against Christian ethical traditions (both pacifism and Just War). US Christians can lobby their members of Congress to oppose waging war against ISIL because the war is unjust. Concurrently, US Christians can advocate humanitarian aid for refugees fleeing ISIL and policies to encourage nations directly threatened by ISIL to act to end the insurgency. Fourth, trust God. Julian of Norwich usefully reminds us that All shall be well, all manner of things shall be well.